Go to just about any construction or job site around the world and you will find the building blocks architects have used for centuries: metals, wood, stone and masonry. But take a closer look at the new home being built in your neighborhood or the commercial building taking shape in your city, and a comparatively new building tool emerges: plastics and plastics derivatives. The building and construction sector is currently the second largest consumer of plastics (behind packaging) and it will increasingly use plastics and plastics derivatives given its wide functionality and distinct advantage of other traditional building materials in terms of flexibility, lower costs, energy and weathering efficiency and durability according to an SPI: The Plastics Industry Trade Association report issued at the 2016 International Builders’ Show in Las Vegas. 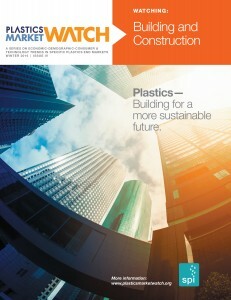 The report, “Plastics Market Watch: Building and Construction” is the fourth in a series published by SPI analyzing key factors impacting the plastic industry’s key end markets. The leading uses of plastics for residential and commercial construction include roofing, insulation, wall coverings, windows, piping, composite “lumber” planks and rails, flooring and structure wraps. “The innovation within the plastics industry to improve and diversify products is matched by the building and construction sector’s pace to find and use new solutions to address fundamental issues like structural integrity, energy savings, recycling, and cost savings,” said William R. Carteaux, SPI President and CEO. According to the report, while the building and construction sector has not regained its prerecession vigor, it is making steady progress with the promise of growth in the future. Globally, China, India, and the U.S. will be the primary drivers of construction activity as India is on pace to overtake Japan as the third largest construction market between 2017 and 2022. SPI will continue its Plastics Market Watch reports in 2016—“Automotive Recycling” will be published in the first quarter. Previous reports, including “Automotive & Transportation, “Healthcare & Medical Devices” and “Packaging” are available on the SPI website. March 31, 2017 The economic impact that consumers have when they toss their bottles into their blue bins and haul them out to the curb every week is routinely overlooked. Recycling has an environmental impact for sure, but it also makes a difference in the lives of workers who are the lifeblood of the recycling and plastics industries. Put simply, your bottle means jobs.